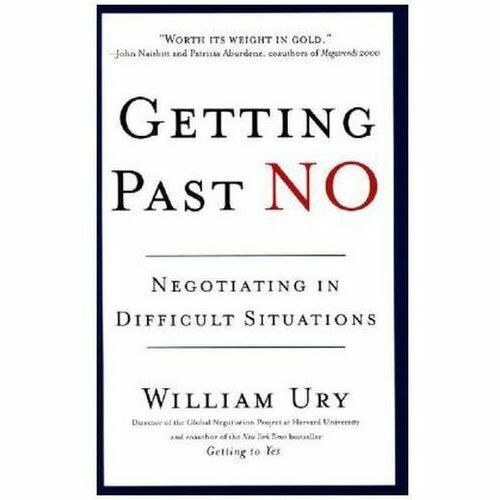 We all want to get to yes, but what happens when the other person keeps saying no?§§How can you negotiate successfully with a stubborn boss, an irate customer, or a deceitful coworker?§§In Getting Past No, William Ury of Harvard Law School's Program on Negotiation offers a proven breakthrough strategy for turning adversaries into negotiating partners. You'll learn how to:§§- Stay in control under pressure§- Defuse anger and hostility§- Find out what the other side really wants§- Counter dirty tricks§- Use power to bring the other side back to the table§- Reach agreements that satisfies both sides' needs§§Getting Past No is the state-of-the-art book on negotiation for the twenty-first century. It will help you deal with tough times, tough people, and tough negotiations. You don't have to get mad or get even. Instead, you can get what you want!